Gluten free polenta and almond shortbread topped with caramel and chocolate. 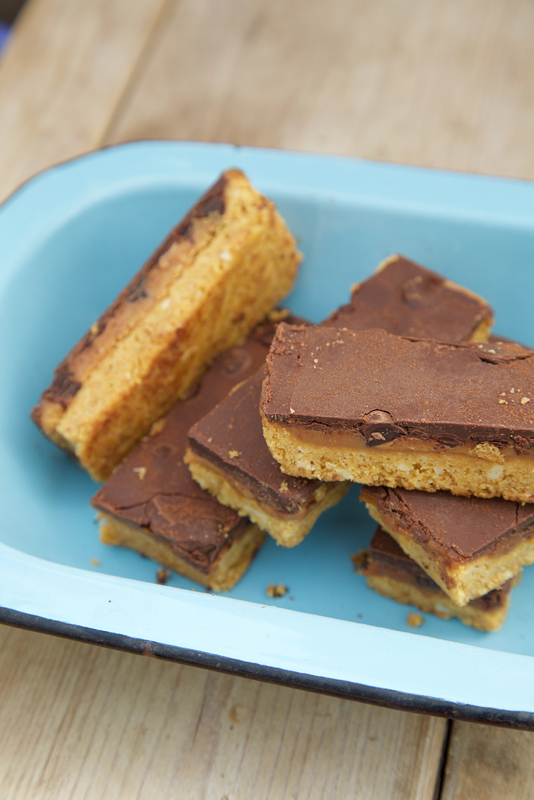 Our version of a millionaire's shortbread. Our signature polenta, ground flax and almond shortbread base has a thick layer of caramel spread over and is then studded with dark chocolate buttons. The dark chocolate topping is melted with a little UK produced rapeseed oil - this results in a soft covering of chocolate. The whole lot is then dusted with chocolate powder. This may sound quite rich but the dark chocolate works to keep the sweetness of the caramel in check. Suitable for vegetarians. Allergen information can be found here. The caramel in the Chocolate Caramel Shortbread contains RSPO certified sustainable palm oil. Part of our Classic Range of well established favourites. "I have just flown with Virgin Atlantic and had to write and tell you how delighted I was to receive a Honeybuns Chocolate Caramel Shortbread as part of my gluten free afternoon tea. What a wonderful change from the usual dry rice cake...fantastic! Long may Honeybuns rule the gluten-free skies," M.M. "I love your Chocolate Caramel Shortbreads! I have only just discovered your company today when buying from my university cafe. I have really struggled with finding snacks I like after finding out I had coeliac disease. But now I know what to look out for!," L. G.
"Had this snack on my virgin Atlantic flight yesterday - all I can say is yum, yum, yum!," S.S.
"I had one of your millionaire shortbreads yesterday at a National Trust cafe. Delicious and great to find something I can eat!," H.D. "Recently experienced your divine caramel shortbread in my gluten free travel lunch on Virgin Airlines. I was astonished to have a tasty pudding for once!," L.L. "Whilst on a virgin Atlantic flight I was lucky enough to be given a Chocolate Caramel Shortbread in my gluten free afternoon tea. OH MY! It was without doubt theeeee most delicious dessert I have ever tasted and I want more! !," H.R. "I would just like to say thank you for your amazing Chocolate Caramel Shortbread. I discovered that they are sold in my university campus and they have acted as a wonderful pick-me-up during the long days of studying and on working on my dissertation," E.C. "My husband claims you make the best Millionaires Shortbread," E.V. "I tried one of your chocolate caramel shortbread today. I don't have a gluten free diet, but I will definitely be buying more of this amazing and outstanding product and will certainly be recommending it to my friends who do have to have a gluten free diet! It is truest delicious!," B.L. "I love love love your Caramel Chocolate Shortbread! I love the texture of the base and the thick layers of caramel and chocolate!,"C.R. "This is gorgeous! I have just eaten my second one (not in a row). The richness of the plain chocolate cut by the sweetness of the caramel and balanced by the wonderful texture of the shortbread is a real treat. I am not gluten-free in my diet, I choose this item simply for it's quality. Love it. Thank you, and keep up the good work!," G.D.